What could explain the international community’s disinterest in addressing wartime excesses? Nanda Prasad and Gangamaya Adhikari are on the 134th day of their fast-unto-death at Bir Hospital, being kept alive through a protein tube to the neck, but they have not been visited by representatives of Western embassies, international human rights organisations, the UN and OHCHR. The couple are protesting the brutal murder in 2004 of their son, Krishna Prasad Adhikari, a 16- year-old schoolboy who had nothing to do with the conflict. The killing cannot be considered ‘political’ just because the perpetrator was Maoist. The ruling by the Supreme Court of Nepal as well as OHCHR’s own handbook on application of the proposed TRC to Nepal under international standards both indicate that there is no option but to apply the criminal justice system on this case. Even if the legality and process were unclear to some, it would still seem the duty of the international community to visit the couple on the grounds of sheer compassion. All the Adhikari couple demand is: Our son was murdered, we want the perpetrators and others involved to be identified and prosecuted. Having sought justice for nine long years and having been inhumanely treated by the police and state, they came to the conclusion that the only way to get justice was through a satyagraha. The couple has refused to heed the continuous plea of activists that they need to remain alive to see justice done and end their hunger strike. But such is the level of the couple’s scepticism about the ability and commitment of the police, state administration, politicians and rights activists, that they are unwilling to take food in the absence of arrest and credible prosecutions against the accused. The newly formed Parliament is slowly taking up the matter, the topmost levels of bureaucracy is exercised. One can make out that police has not shown due diligence and is lagging in investigations. 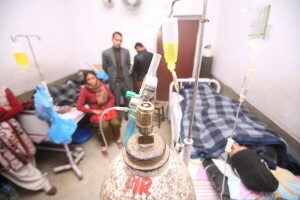 Well-known civil society activists have been unconcerned, never bothering to visit Cabin 16-17 of Bir Hospital where the Adhikari couple are kept under intravenous medication and protein-feed. Neglect of the demand for justice will leave a permanent open wound on the body politic, and the cumulative pain of the victims can rise to explosive proportions over time -– just remember the events, Bhairabnath and Bardia disappearances, Doramba and Madi mass killings, and the names, Maina Sunar, Muktinath Adhikari, Guru Prasad Luintel, Arjun Bahadur Lama, Dekendra Thapa. The international community is duty bound to support any society that is challenged on human rights and democracy. While engagement with constitution writing or the day-to-day conduct of politics would be considered interference on sovereign affairs, not so actions to protect human rights and pluralism. Over the decade of conflict and the transitional period of seven years since, Western embassies and aid agencies were quite involved in matters of human rights and democracy. They supported the National Human Rights Commission, forensic investigations, investigation teams such as Doramba, visiting Bardia to study the disappearance of Tharu youth by the state security, and so on. Could it be that the aid agencies and embassies believe that they would be perceived as ‘playing politics’ in showing concern for the Adhikaris? They may believe that the Maoists will derail the constitution-writing, but the need for justice for human rights excess during the conflict by either side must be investigated and prosecutions carried out. 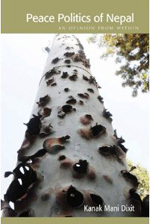 Nepali society, especially after being placed back on the democratic track by the November 2013 elections, is not so feeble that it cannot stand up for justice and challenge the positioning of the Maoists and the state security forces, including the Nepal Army, on transitional justice. Besides, what kind of constitution do we expect to be written if the drafters are the kind that cannot stand up to those who have raped, murdered, disappeared and tortured? However, the lack of international concern about the Adhikaris probably has little to do with worries about the constitution-writing and more with fatigue about human rights in Nepal. In the end, it is the Nepali people who should be up to the fight for justice (and they are), but a little bit of interest of the world community would help. Energised by the need to move on to revive development and economic growth, the major donors and embassies seem to be putting human rights matters on low burn. If true, this is unfortunate. The people want growth and prosperity, but they also know that any attempt at economic growth conducted in the absence of rule of law, human rights, accountability and activation of criminal justice system will not be sustainable. There is direct line from Cabin-16-17 at Bir Hospital to a prosperous Nepali future. Next Post: अन्तरिम स्थानीय सरकार !